Sushi is a Japanese viand consisting of cooked vinegared rice (shari) combined with other ingredients (neta). Neta and forms of sushi presentation vary, but the ingredient which all sushi have in common is shari. The most common neta is seafood. -The basic elements when eating sushi are: a plate, hashi (or toothpicks) hashioki (or poses-sticks), wasabi and gari (pickled ginger or). -The Japanese eat with chopsticks advise or covered timber, or directly by hand, but avoid using metal utensils like forks, spoons or tongs, since they alter the taste of food. -To begin empties a quantity of soy sauce in a small well. In the West it is common to dilute a bit of wasabi in soy, but it is a practice not recommended as it hides the flavor of the whole. 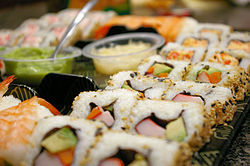 -Take a piece of sushi and if you want to soak in soy sauce slightly, never on the side of rice, as it would fall apart. -Bring the whole piece in his mouth and eat a snack whenever possible. -When not in use chopsticks, leave them on the hashi-oki or on the plate. -It is not considered polite to give food to another guest with their own sticks, play with them, keep them separate, puncture the food, or move through the air. By leveraging a common dish to use the front of the sticks. -Between bites you can eat a piece of gari with a little wasabi to cleanse the palate of flavors. -Try to completely clean your plate of food, especially rice. -Do not eat in large quantities because wasabi is very spicy.